First published in 1957, Here Lies Our Sovereign Lord is the third in Jean Plaidy’s Charles II trilogy, which can also be purchased in an omnibus edition titled Charles II or The Loves of Charles II. 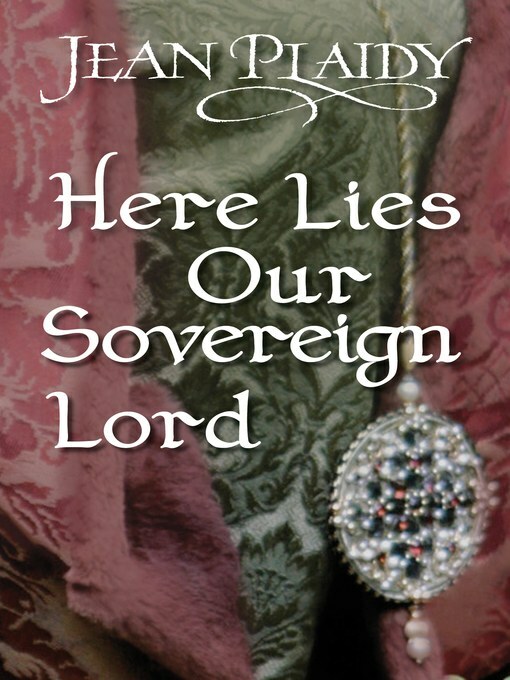 The phrase “Here Lies Our Sovereign Lord” is from a satirical poem by Lord Rochester and was nailed to King Charles’s bedroom door. “Remembering his exile and determined not to go “traveling again,” Charles II hid his secret political game with Louis Quatorze under a cloak of gay immorality. His objects were to keep religious strife and revolution away from his country and the crown on his own head. Of the women who ministered to his pleasure at this period, three were more important to him than others: Nell Gwyn–the orange girl who graduated to actress and King’s mistress; Louise de Keroualle, Duchess of Portsmouth, sent by Louis into England to act as his spy; and Hortense Mancini, the “most beautiful woman in the world,” who came to escape a mad husband obsessed by “purity.” Each is here vividly recreated–and with them the famous courtiers, Buckingham, Rochester, and Charles Sackville and the Dukes of York and Monmouth. “Charles II, determined his people shall know peace and religious freedom, intrigues with Louis XIV for the money that will keep him independent of Parliament and dispel the shadows cast over the throne by his son Monmouth and his own brother, the Duke of York. “It is so generally believed that Charles died a Catholic that I feel I must explain why I do not hold that belief. The deathbed scene has always worried me a great deal because I have felt it to be out of line with Charles’ character. Therefore I was anxious to find a convincing explanation. It is true that Father Huddleston came to him on the night before he died, and that Charles made no protest when it was suggested that he be received into the Catholic Church; but when all the facts are considered I think there is a viewpoint, other than the accepted one, which serves to explain this acquiescence. On that Sunday, the 1st of February, 1685, he ate little all day; he passed a restless night and next morning, while he was being shaved, fell down ‘all of a sudden in a fit like apoplexy’. He never fully recovered, although he had periods of consciousness during the next five days which were spent in great pain aggravated by the attention of his physicians who, not knowing what remedies to use, applied most of those which they had ever heard. During those five days, hot irons were applied to the King’s head, pans of hot coals to all parts of his body, and warm cupping glasses to his shoulders while he was bled. Emetics, clysters, purgatives, blistering agents, foul-tasting drugs, and even distillations from human skulls, were given to him–not once but continually. Spirit of sal ammoniac was put under his nose that he might have vigorous sneezing fits, and when he slipped into unconsciousness cauteries were applied to revive him. So in addition to the pain of his illness he had these tortures to endure. He knew that he was dying on the Monday, yet he made no effort to see a priest. When Bishop Ken begged him to receive the rites of the Church of England he turned away; but this was a natural gesture, for he was suffering great pain and discomfort, and he had never been a religious man. All though Monday, Tuesday, Wednesday, and Thursday he had been, as he said, ‘a unconscionable time a-dying’, and on Thursday night the Duke of York and the Duchess of Portsmouth (who both had their reasons) brought Huddleston to his bedside; and at this late hour, according to those few people who were present, Charles joyfully received Huddleston’s ministrations. I believe that Charles was too ill to resist the importunings of his brother and his mistress. I believe that in that easygoing manner which had characterized his entire life he gave way as he had so often before. That is if, after four days of acute agony, discomfort, and intermittent unconsciousness, he was even aware of what he was doing. According to Burnet, Ken pronounced the absolution of his sins over the King’s bed, and in his last hours Charles said that he hoped he should climb to Heaven’s gate; ‘which’, goes on Burnet, ‘is the only word savouring of religion that he was heard to speak’. Charles’ attitude to religion had always been constant. He had modelled himself on his maternal grandfather, Henri Quatre, who had ended religious strife in France when he changed from Huguenot to Catholic, declaring that Paris was worth a Mass. Charles believed that religious toleration was the way to peace. He was tolerant to Catholics, not because he was a Catholic, but because they were being persecuted. He has said of Presbyterianism, ”Tis no religion for gentlemen.’ This was during his stay in Scotland when he had been forced to hear long prayers and sermons every day, and repent of so many sins that he said: ‘I think I must repent that I was ever born.’ He had declared: ‘I want every man to live under his own vine and figtree.’ But this did not mean he was a Catholic. His attitude to the Church was often frivolous. He had in his youth been hit on the head by his father for smiling at the ladies in church; and as Cunningham says, ‘he had learned to look upon the clergy as a body of men who had compounded a religion for their own advantage’.